The African Union (AU) peacekeeping force in Darfur is struggling to halt widespread abuses and violence, but Sudan is rejecting plans for it to hand over to a larger, stronger UN mission. More than two million people are living in camps after fleeing almost four years of fighting in the region and they would be even more vulnerable without any peacekeepers. 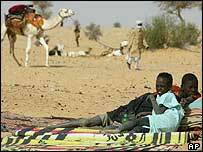 Sudan’s government and the pro-government Arab militias are accused of war crimes against the region’s black African population, although the UN has stopped short of calling it genocide. Sudan also rejects moves by the International Criminal Court to name and then try war crimes suspects.